Carrie Haddad Gallery is pleased to present an exhibit of new work by five gallery artists. Abstract painting by Jenny Nelson and Nancy Rutter will be on view alongside encaustic paintings and works on paper by Donise English. Andrea Moreau will showcase her latest stamp drawings with small, whimsical landscapes by Laura Von Rosk. “Cameraless” photography by Birgit Blyth will be featured on the second floor. ‘Contemporary Artists’ will be on view March 6th – April 21st, with an artist reception on Saturday, March 9th from 5-7pm. All are welcome to attend. Woodstock based artist, Jenny Nelson, will showcase new abstract paintings that are united in their calm palette of blues and greys with the occasional pop of chartreuse and peach. Nelson’s tendency to focus on color families and shapes for long periods of time result in a group of paintings that are at once uniquely dynamic and closely related. Nelson’s canvases begin with loose, gestural strokes whose expressive application is more akin to an improvised dance than a formulated painterly sketch. 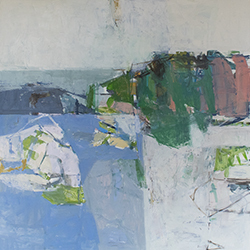 Classically trained at Bard College, Nelson’s balanced compositions attest to her years of working from life. Maintaining a strong sense of space and structure was imperative to the artist as she transitioned from academic to abstract painting, a stylistic quality which is still evident in her work today. She has exhibited regionally and nationally and currently teaches at the Woodstock School of Art. Laura Von Rosk will exhibit a new series of small-scale landscape paintings informed by subconscious memory and well-known art movements. With intimately sized canvases, the artist can achieve an alluring illusion of space, perhaps an attribute which stems from her love for miniaturization and intricacy found in Northern Renaissance and Indian manuscript painting. Oftentimes, valleys, forests, and rolling hills fade into soft mist or are painted with a ‘fish eye lens’ sensibility, further alluding to their dream like nature. Von Rosk earned her MFA from the University of Pennsylvania and BFA from SUNY Purchase. She exhibits nationally and has shown with the gallery for over ten years. Inspired by the seasonality of color and light, Nancy Rutter will feature her most recent body of work, entitled the ‘Silver Series’. Departing from warm hues of magenta and orange, the artist now seeks color inspiration in the subtleties of her winter environment. Rutter’s atmospheric landscapes are dominated by a palette of cool monotones, recalling reflections on frozen water and snow-covered fields that introduce tones of grey and silver with delicate touches of violet and blue. The artist studied at the Art Student’s League and NYU. She now lives and works in Ancram, NY. Andrea Moreau’s subject of choice; the postage stamp. As unassuming as it might seem, the artist has used this tiny piece of ephemera to inspire imaginative scenes in her work since the mid 90’s. Moreau’s use of stamps began after a trip to Mexico, where she collected a few to bring home and work into her journal. The stamp’s imagery acted as a starting point for detailed colored pencil works on paper that expanded into abstract motifs, figurative drawings, or reimagined landscapes. This creative mediation on the visual souvenir become an “act of escapism” for the artist, allowing her to re-experience her travels in a new way. Now incorporating stamps from places she’s never been, her recent work adopts a reality of its own, forming images based on mere impressions rather than actual experience. The artist received her MFA from Ohio State University and lives and works in Beacon, N.Y.
A new series of encaustic paintings and works on paper by Poughkeepsie based artist, Donise English, will also be on view. The work continues the artist’s investigation of patterns found in maps, blueprints, and architectural drawings, that are then deconstructed into abstract forms. English teaches Studio Art and Art History at Marist College and shown with the gallery for over ten years. The second-floor photography gallery will feature a solo exhibit of chromoskedasic painting by Birgit Blyth. The experimental technique, requiring no camera, involves the use of silver particles in black and white photographic paper to scatter light at different wavelengths. When exposed the photographic chemicals reveal complex tonalities of brown, green, black and purple. Applying her material in a painterly fashion, Blyth creates abstract grids and gestural compositions that exude a unique ethereal beauty. The artist has used chromoskedasic painting in her work since the 90’s and has shown with the gallery for more than 20 years.